Work with all your senses to liberate yourself, cells, mind, and soul, from all sorts of energetic and chemical negativity. Learn ancient methods to unleash yourself and create a healing environment that originates and springs from you, and becomes a reflection of what you "send". It is a job that can be done only when you have cleared the clutter from both mind and body. This retreat is a healing art to find, feel, and get to know your prana - life force. During this retreat, you will be accommodated at Olive Retreat. Unique, enchanting and beautifully remote, Olive Retreat leads you to a hidden gem nestled on the coast of Thailand. Set in the jungle, next to a nature preserve, yet located just a few hours from the airport, the property is located in the lovely fishing village of Khao Tao, right on a often deserted beach, and framed by fabulous mountains and temples. Olive Retreat have set out to leave as low an impact as possible and minimum building has taken place on the land and around the shala where you will have your most of the classes. Toilets and showers are all outdoor, and wildlife abounds. Expect a deer to be chewing near your tent, or a peacock or dozen to come swooping down from the mountains. Two kinds of monkeys visit you often, both of them quite entertaining. Prana Pod is totally unique and unprecedented Connection Boosting Units. CBUs, or Prana Pods, or permanent tents were designed to minimize the space between your body and your consciousness and the earth as a living ecosystem while sleeping. If you really want to connect, deeply connect with your maker, than minimizing the distance between you and nature, and interacting with your personal living space throughout the day's changes, is fundamental. The CBUs are designed to accommodate air flow, energy flow, transparency, light, non-corrosivity, and health. Thailand is the prefect climate for living and sleeping outdoors. Every night, there is a slight breeze, and every nuance of it cascades right through their high strength, lightweight design. You will not miss a breath, a sound, a subtlety. Be it a day or night, nothing stands between you and nature but a few millimeters of sturdy screen. The inner sleeping unit slides out for amazing star gazing on the many strikingly clear nights, and on those occasions when it rains, slides back in a matter of seconds. The mobility of the unit also allows greater floor space for naps, yoga, meditating, reading, hanging out, or just surfing the web. You will go layer per layer through the chakras. Like antennas that send and receive information, Olive Retreat's environment will constantly communicate with you and you can prepare for the messages that either nurture you, or block you. The process is complicated to explain, but once experienced it, it is easy and efficient. Throughout your retreat, you will indulge in activities like Vedic art, colors, classes, yoga, dialogue, marma acupressure, breathing, massage, spices, aromatic touches, theory, meditations, pranayamas, and much more. All of these activities will help you de-block and recreate. Everything that Olive Retreat will teach can be integrated in a modern lifestyle and practiced back home, and they hope you will spread this amazing knowledge. Apart from a bunch of new super-cool exercises, you will do the regular program, which will take you further and deeper. You will work with your unconscious mind, see the patterns, and the forces behind the conscious. Yoga enhances the detox process in a natural and healthy way. A flexible body is more likely to be a healthy body. Every morning, you will start your body and mind detox retreat with a yoga class tailored just for you adapted to your needs, flexibility, and strength. All levels of experience are welcome from beginners to intermediate and even advanced. All sessions are followed by relaxation and breathing exercises, or pranayamas. Extra sessions are offered for those who want. Mediation boosts your immune systems, raises your energy levels, alleviates, or eliminates anxiety and depression, raises your sense of self esteem, helps you to make decisions, brings peace and tranquility, clears your minds, boosts creativity, and more. At this Thailand mind-body detox retreat, you will review and practice various forms of meditation to find which one works best for you. Join Olive Retreats and learn about meditation and how meditation can help improve your life in so many ways, while at the same time, making you eternal. You have questions and Olive Retreat have more questions. Each day, you will choose a beautiful setting and engage in stimulating dialogues about topics as varied as the science of nutrition to what thoughts hold you back from experiencing contentment. Olive Retreat believe in the importance of discussion for leading you to your own unique and deeper truths. Timing is loose and weather dependent. All activities are optional, you do not have to do everything. If you come to relax and sleep, then, that is what you need. You will be visiting temples, the markets, the jungle, the beaches, and the fishing villages. All excursions are included and a part of the program to discover yourself. After earning an MBA in Economics from the University of Stockholm, Cristina navigated her way upward through the corporate ranks in some of Sweden's highest earning and most recognizable companies, until as with many leaders in the wellness industry a personal experience lead her to leave her management position and change careers. Her teachings and practices are based on her 25 years of prolific study and personal trial and error. She became a devoted disciple to famous holistic leaders and her healing focus became Ayurvedic, orthomolecular medicine, Ashtanga yoga, pranayama, and meditation. 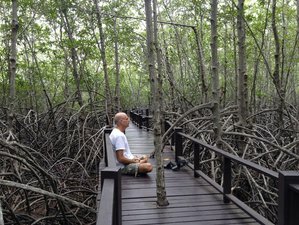 Ray started meditation whilst he was trying to recover from a medical adversity, The activity of meditating for Ray is listening to the voices of nature, wind, water, insects, etc. This would lead him on a journey that began with his being diagnosed and healed from Celiac Sprue disease by a naturopath in Oregon, through over forty countries until today, where he gives part of his time to the mission and vision of Olive Retreat. During that time Ray has lived and taught in universities in the USA, China, Lesotho, Saudi Arabia and Thailand, and in recent years, served as a communication advisor. This retreat will take place in Thailand. You will be accommodated at Olive Retreat, Khao Tao, Nong Kae, Thailand. In Thailand, Olive Retreats combine the best of all worlds, nature, village life, beaches, mountains, and forests to enhance the body-mind detox process. Olive Retreats in Thailand is totally unique, leaving guests with a renewed sense of the possible by the time they leave. In Khao Tao, they find an opportunity to heal that does not involve pretending, pushing ourselves, or faking it until you make it. The village and its beaches and nature preserves offer a worldview unaffected by the view of life behind much of your suffering. Imagination is the first solution, and Khao Tao offers us that, and more. You will be served chakra-colored vegan, whole, and gluten-free meals. All of your food and drinks will be detoxifying meals. It will also include spiced water. You will also have a cooking or smoothie classes in this retreat. Food is very important, but it is not only about food. Olive Retreat serves a delicious, nutrient-packed, plant-based diet as the nature produced it. There will be no refined materials, no sugar, no gluten, no yeast, etc. in the meals that are served. Vegan is the simplest detox. You will not be hungry, tired, or sluggish. Olive Retreat will teach you to read your own body to restore and maximize your health. You will be delighted by the food. You can also opt for all-liquid intermittent fasting day(s) if it is suitable for you. You can visit temples, beaches, markets, and go shopping in your free time. You can also opt for activities like hiking, cycling, running, and much more. You can also have massages by paying cash on site. Excursions to markets, temples, mangrove forest, nature reserves, OTOP weaver project, etc. Yoga is part of a healthy life. From us you bring health home. Discover what health means to you and apply it to all parts of life. 96% change after a visit. I would like to receive the BookDetoxRetreats email newsletter, including special Detox Retreats offers and giveaways. Show this Detox Retreat to your friends.